Democratic president nominee Hillary Clinton is leading her biggest opponent Donald Trump by a significant amount in Florida shows a poll released by Saint Leo University on Tuesday. The latest poll shows that Clinton has 52% of the support from likely voters in Florida, while 38% surveyed put their support with Trump. Gary Johnson the Libertarian candidate received 8% of the support while Jill Stein the candidate from Green Party has backing of 2%. 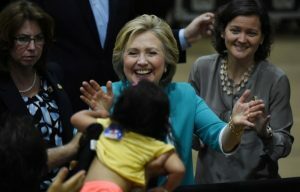 Unless there is a movement that is unprecedented toward Donald Trump, due to the debates, or a more likely external shock in the system, Clinton can put Florida safely in her own column, said Franck Orlando the Director of the polling institute. It should be noted, due to its importance, that while the majority of the most recent polls have Clinton well ahead in Florida, they do not show her lead as being quite as big. Trump maybe behind in the state, but Marco Rubio, Florida’s Republican Senator is ahead in a matchup between Democratic Reps. Alan Grayson and Patrick Murphy who will meet in the state’s primary on August 30. Rubio was ahead of Murphy by 8% with over 16% of the people polled saying they remained unsure. When that is put against Grayson, Rubio was ahead 47% to 34%, with 19% still unsure. The poll, which is conducted online and took place between August 14 and 18, has a plus or minus margin of error of 3 points. Rubio at one time during the heated Republican primary race said that Donald Trump was an erratic, dangerous spray-tan con man. Now that Trump has been nominated by the Republicans as their presidential candidate and Rubio is up for reelection, the senator’s tone has become different. Rubio no longer is criticizing Trump. However, he is not exactly bursting with praise. Nonetheless, the Democrats are attempting to make him appear to be a hypocrite for supporting the same man he said previously should not have any access to codes for nuclear weapons and for returning to the Senate race after saying he would not. Patrick Murphy a U.S. Representative said the real con man was Rubio. Murphy said that how many times did Rubio say he would not run against for the Senate, but is doing so. In July, Rubio said he supported Trump because of giving a pledge early during the primaries to support the nominee from the GOP.